You are here: Home / Sewer / What is the Proper Drain Slope for Your Drain Pipe? There are many factors that play into how much fall a sewer line needs. You’ll need to install pipes with the proper drain slope in order to stay in code and ensure that everything will work properly. How did people survive before indoor plumbing? When you consider how complicated indoor plumbing is, it’s remarkable it exists at all. There are tons of homeowners out there who love DIY projects around the house. It can be a great way to learn a new skill or just feel productive. With plumbing, however, it can become a real headache. One important part of any plumbing system is the drain pipe. For your drain pipes to work, the precise drain slope needs to be calculated. Although it’s a critical job only for a professional, it’s good to know how it works. Know how far the waste needs to travel before you can consider the drain slope. For this, your plumber is in the yard with stakes and string. The string outlines the pipe system, and measurements are taken from them. This determines how deep your pipe needs to be, how long it should be and what depth you need to dig. This goes hand in hand with measuring. Your plumber may adjust directions and measurements as things come together. The goal is for your drainage pipe to be as short as possible. Longer drain pipes increase the chances of clogging. To have your drainage travel in a straight line is ideal. But if you have trees in your yard, it may not be possible. A curveball like this can force a recalculation of how much drainage pipe is needed. If you’re a math enthusiast, this step is great, although it’s a chore best shared with your plumber. 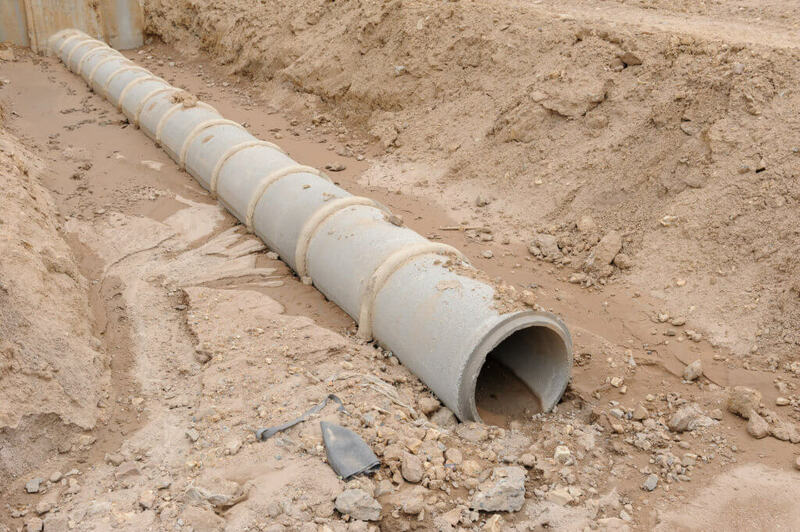 For waste to move through your sewer line, you need the right drain slope. This is a precise calculation because a slope too shallow won’t move waste, while a slope too steep will move it too quickly. If your yard’s layout requires your drain pipe to twist and turn, the measurements get more complicated. You need to calculate drain slope for each part of the pipe. If you’re a math whiz, just subtract your elevations and divide that with the pipe length and you’re done. Then compare the results with your plumber’s. At this point, you’re ready to purchase the piping for your sewer line. This is the fun part if your plumber doesn’t handle it. What DIY champs don’t love a mission to their local home improvement store? You’ll need to buy special connecting joints for any parts of your line that twist and turn. Before you plan a huge drain slope excavation, get professional advice. At Eyman Plumbing, Heating & Air, we’ve helped homeowners with improvement projects since 1957. Don’t forget to visit our blog for tips and tricks. Call us at (402) 731-2727 if you have any questions.